That’s what I said to myself as I watched the pile of grilled chicken breasts and spareribs disappear from the flaming barbecue grill at our hilltop lookout. As the sun made its way slowly toward the Pacific, the 17 of us juggled maps, plot plans, and price lists while enjoying a late lunch and absorbing the feel of the property and the inspiring view. We’re taking in the vista from one of the high points at Los Islotes, a master-planned community located on the westward-facing side of the Azuero Peninsula, also called the Sunset Coast, more than an hour off the Pan-American Highway at Santiago. The ride from the highway seemed to take forever in my hurry to get to the project. But I was missing the point. As I spoke to the Los Islotes property owners and some of the local expat residents, I realized that they didn’t want to be near the Pan-American Highway, or Panama City…or any other source of noise, pollution, or traffic. The people in this area are here for the peace and quiet. It’s the relatively remote setting, the quiet beaches, and the wild, natural environment that brought them here in the first place. So the ride down from the highway only reinforces the fact that they’re leaving the stress and bustle of the real world behind. One unique feature of the Los Islotes property is the dramatic, hilly terrain leading right up to the ocean. The hills and valleys prohibit a boring, row-upon-row layout when planning the homesites and allow the houses to be tucked here and there among the hills. This means that there are scores of ocean-view properties with relatively unobstructed sea views…without having to look at the back of someone else’s house. The view is great. You’ve got the Pacific sunsets, as you’d expect. But the ocean is also dotted with the three small islands within swimming distance from which the project gets its name, as well as the larger, well-known island of Cebaco. Granted, any Pacific view is a good view. But a view that includes nearby islands and an estuary, with small fishing boats plying their way in between, is even better. 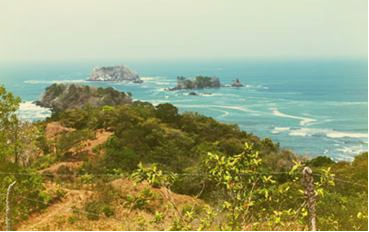 Los Islotes occupies more than 750 acres along this wild section of the Panamanian seashore. It includes more than a kilometer of beachfront, with one protected beach that’s best for swimming, and another better suited to surfing. Aside from the natural features, the project also plans a clubhouse, three pools, an equestrian center, tennis and basketball courts, a fitness center, parks, plus hiking and riding trails. All utilities will be underground, and fiber-optic Internet will be available throughout the property. Of course none of this stuff is built yet. Aside from the roads, the infrastructure is just getting started. But the project is well-funded by Lief Simon and company, and sales are brisk, so I don’t see the pace of infrastructure completion slowing down. There’s one thing that no developer can provide: fishing. There’s excellent, untapped fishing just offshore from Los Islotes, and you don’t have to charter a boat to get to it….you can just drift among the nearby islands and haul in a number of sport fish, including Dorado. Lots here start at US$32,000, and go up from there. Lot #6—the one I mentioned at the beginning—has an asking price of US$138,000, but I spoke with Lief Simon and he’s willing to extend the recent 5% conference discount to Overseas Property Alert readers, which brings the price down to US$131,100. Why did I like Lot #6? Obviously, not because it was the cheapest. I liked it because it has an unobstructed, westward, sunset view of the estuary from the privacy of the backyard or from the rear deck of the home that eventually goes there. I think it will be among the best views on the project and one of the most valuable lots. The same view is shared by Lots #1, 2, 3, and 7. And it’s not just me who likes the view. Kathleen Peddicord and Lief Simon have their own homesite here as well. And if anyone should know where the good views are, they should, as they are the founders of the project. If you want a home that offers the convenience of big-city living—theater, sophisticated nightlife, and fine dining—then Los Islotes won’t be for you. But if you appreciate the wide open spaces, wildlife, great fishing, and a simpler, relaxing lifestyle, then Los Islotes should be high on your list of places to visit. Follow the link to request more information on Los Islotes. The properties are reasonable…the fishing, surf, and sunsets are free. Is possible to find property for US$10,000 in Belize… or a house for US$50,000? Yes, you can find both in Belize: a plot of land for less than US$10,000 as well as a house for less than US$50,000. But you won’t find them in the upscale planned communities that the country is known for. You’ll need to dig into the local market. For example, you can get an attractive building lot in Santa Elena for US$7,400 or a 5,000 square-foot town lot in San Ignacio for US$10,000. In Ashridge Estates, they’ve got four adjacent building lots selling for US$3,500 each. Houses start at about US$39,000 for a two-bedroom, one-bath house in the town of Santa Familia, 15 minutes from San Ignacio. The house comes on a large lot with fruit trees, coconuts, mangoes, guava, noni fruit, limes, avocadoes, and bananas.